Russia's natural gas giant is planning to put three billion cubic meters of gas up for auction - yielding to pressure from European customers, experts say. It may also scrap plans to stop Ukrainian gas transits, reducing supply risks linked to the construction of a new Turkish route. In September 2015 Gazprom will hold an auction for the supply of three billion cubic meters of gas to the European market, business daily Kommersant reports. Gazprom CEO Alexey Miller told the newspaper that it will be a spot bid auction, for the supply of gas "here and now, rather than the traditional take-or-pay model used by Russian companies, where buyers commit to purchase an agreed amount of gas during a set period - but pay fines if they take less. The Russian energy company also unexpectedly announced the possible continuation of gas transits through Ukraine. Last year Gazprom said it would cut Ukraine out of the transit market after it announced a new line via Turkey. The Turkish Stream will pipe gas under the Black Sea for delivery to southern European countries. If successful, the plan will not only allow Gazprom to sell more volume, but put it in a stronger negotiating position on the Turkish stream, which is not yet finalized. Gazprom is clearly signaling that it is considering alternatives to increase gas supply to Europe, Kapitonov added. Ilya Balakirev, a senior analyst at UFS IC, says Gazprom occasionally sells small volumes of gas on the spot market, but the company is unlikely to abandon the take-or-pay scheme. "Pipeline deliveries have fixed transportation costs, and if the actual supply volumes are significantly reduced, the company incurs losses," he said. 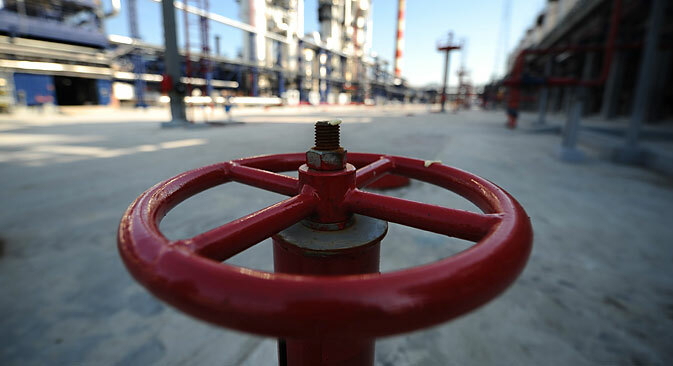 But Gazprom could abandon the take-or-pay scheme if gas transit technology changes. Such schemes are not used for tanker shipments of liquefied natural gas, he noted. Russian President Vladimir Putin has also told Gazprom to enter talks about extending Ukrainian transits after 2019, Gazprom chief Miller says. The company had said it would stop using that route in 2019, when the current contract expires. In April 2014, Miller said that due to the construction of the Turkish Stream pipeline in 2019 Gazprom would end gas transits through Ukraine. Kapitonov believes Putin's order is designed to tackle a number of objectives. It will increase pressure on the Turkish side in the Turkish Stream discussions and encourage rapprochement with Ukraine. "The abandoning Ukrainian transit was not a constructive position," says Mikhail Korchemkin, of East European Gas Analysis. "Potential Turkish stream partners may be becoming intractable, and this is a signal for them," Balakirev says. He believes that the first phase "the Turkish stream, intended only for Turkish market" will be completed in any case. Earlier this month, during the St. Petersburg International Economic Forum, Gazprom announced plans to double the capacity of the Nord Stream pipeline that connects the Russian gas supplier with markets in northern Europe through Germany. The gas company signed a deal memo with Anglo-Dutch petroleum giant Shell, Germany's E.On and Austria's OMV to build two new gas pipelines under the Baltic Sea with a total capacity of 55 billion cubic meters.